This Totoro version of the Paper Dolls sweater is something I have wanted to do for a couple years now. 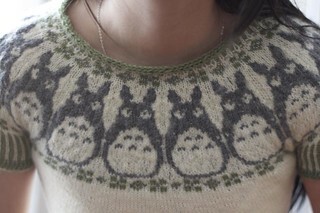 After rewatching My Neighbor Totoro, it was definitely time to make this sweater. This is my homage to Studio Ghibli and Miyazaki. It didn’t quite work quite like I wanted it to. Mainly that even though I was at gauge, my yoke ended up a bit tighter, but I think worse of all, the underarm and sleeve cap is tiny. I’ve found that small arms are an issue with Kate Davies patterns. I can just get away with it because I don’t have big arms to begin with. It doesn’t look tight, but the upper arms are very restrictive. Relative to the upper body, the torso is on the looser side actually. I did extra waist decreases, but it still gave me some positive ease. Yarn: I chose the Sisu based on economy and saw many others used it for this project too. I couldn’t find another affordable twisty yarn that would suit this. It is a bit fuzzy, but not coarse for a sock yarn. I would still try to wear a thin long sleeve t-shirt-underneath. Studio Ghibli movies watched and rewatched while making this jumper: Whisper of the Heart, My Neighbor the Yamadas, Kiki’s Delivery Service, The Cat Returns. Paper Totoros, started October 7th, finished November 28th 2012. Yarn: Sandnes Garn Sisu (80% superwashwool 20% nylon) 191 yards / 50 g – Under 4 skeins of the cream, less than one each of the green and the grey. I have one full skein of the white left, but good thing this is sock yarn as that is always useful. Modifications & Notes: A lot! Gauge achieved (ish) on 2.75mm. For the ribbing, knit the MC with my right hand and Norwegian Purled with the CC1 in my left. Decreased every 8 rows 8 times and increased every 6-8 rows 7 times. For the decreases, used paired k2tog and ssk decreases instead of the one stated in pattern. For the increases, used this increase and its mirrored version where you pick up from the below the stitch on the right of where you want the increase to go. CO 74 sts on 3.25mm and switched to 3.0mm for ribbing. A little over 2” in total. The underarm is way too small so I grafted it, but I also went back and sewed it from the inside to close the gap and reinforce. Totoro’s mouth: Knit in CC2 one stitch past the one where you want the mouth to be. Slip the last knit stitch (the mouth stitch) to the left needle, bring MC to the front wrap the stitch back to right needle. 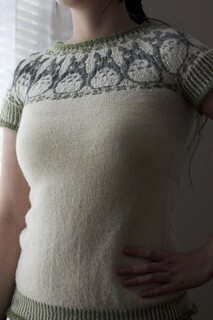 Thanks to KonaSF on Ravelry for sharing her yoke spreadsheet chart with me. I modified the decreases from her chart so that before the last flower repeat, I had 156 stitches (multiple of 12). This maths took me awhile to think about, but I found this knitting evenly across row calculator which helped a lot. After the chart, I decreased down to the the stated 114, but it was already too high on my neck so I skipped short rows, did only 4 rows of ribbing and BOed. Tools/Notions: Stitch holders, scrap yarn. Cost of Project: I used about $35 of yarn. Lovely pattern! It looks great but it seems a lot of work, congrats! Hi Jazz! Yes, it took me a couple of months, but it was good. I enjoyed myself even if the result is not what I hoped for. I’ve been taking my time knitting lately. Thanks! 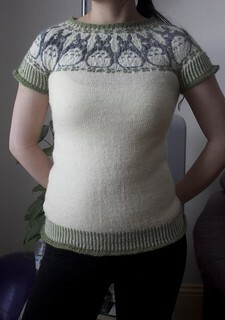 I love this variation of the paper dolls sweater. You did a great job. It looks wonderful. Hi Michelle! Thanks for the feedback. Happy Knitting! Thanks for the warning about the Kate Davies patterns – I definitely couldn’t get away with that, with my thick arms and linebacker shoulders 🙂 Looks very cute on you! Hi Minding My Own Stitches! I’ve only based my observations on making two of her sweaters but one can definitely adjust. Thanks for the feedback! Such a cute sweater! Great job. Hi Chris! Thanks! Happy Knitting. It looks great, I love that pattern! Hi Nat! The Totoros portion is very cute. I may knit it again in mittens or a scarf. Thanks for commenting!